Hot Under the Collar about Your Air-Conditioning? Home > Uncategorized > Hot Under the Collar about Your Air-Conditioning? 02 Nov Hot Under the Collar about Your Air-Conditioning? Summer time in Australia speaks of test cricket, flies, BBQ’s, holidays – and the sudden need to invest in or switch on your air conditioning system! Since 2008 it has been a regulation requirement that air conditioning systems are sized according to space and heat load of each unique room within a building. This regulation is intended to ensure the supply and installation of appropriate and adequate equipment for each unique application. Air conditioning cooling is usually something that only becomes a pressing issue when the summertime temperatures soar and an otherwise comfortable home suddenly becomes an unbearable hot box! People then either switch on their new system for the first time or otherwise en-masse contact Victoria’s air conditioning companies, with everyone suddenly wanting their new air conditioning system installed or inspected today! The summertime bonanza for air conditioning companies tempts all but the most professional in the industry to forget about the potentially time consuming intricacies of design and sizing requirements and instead focus on the frenzied numbers game at their end. This often results in undersized or inappropriate types of air conditioning systems being installed to dwellings which then go on to become a huge problem for Property Owners – rather than being the comfort item they thought they were forking out the money for! 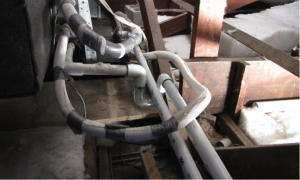 It is not unusual in our experience for air conditioning companies to call up seldom used subcontractors along with inexperienced and potentially unreliable plumbers when it comes to getting the systems installed during these crazy peak periods. Therefore in some instances even well sized and specified equipment can end up being installed in a non-compliant manner which compromises the performance of the air conditioning system and can endanger the house. Refrigerated air conditioning systems also generate vast amounts of condensate water as a by-product of the air conditioning process, particularly during humid weather. This water should be piped to a downpipe in the guttering system and discharged directly into stormwater drainage, however because it takes longer to do it correctly, this is an item of compliance which Metropolis has seen breached countless times and the result can be sudden catastrophic internal flooding or otherwise insidious slow leaking into the structural fabric of the house, including walls, ceilings and foundations. 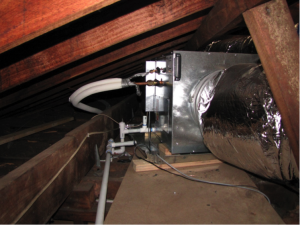 Are you concerned that your ducted or split system refrigerated air conditioning was installed with any of these issues? NON-COMPLIANT WORK – (Above): This unsupported network of condensate drains suddenly broke and flooded the owner’s house with water. NON-COMPLIANT WORK – (Above): Shows both unsupported and poorly uninsulated refrigerant lines along with unsupported condensate drains. The unit will perform below capacity and also risks flooding the house. Find out what’s really going on and whether your air conditioning installation is actually compliant. If you suspect problems, contact us today for an independent air conditioning plumbing health check on your property – Metropolis is your plumbing expert for achieving air conditioning compliance!